Weaving needles into silicon skin pads isn’t what you’d expect many high school students to do on their summer break. 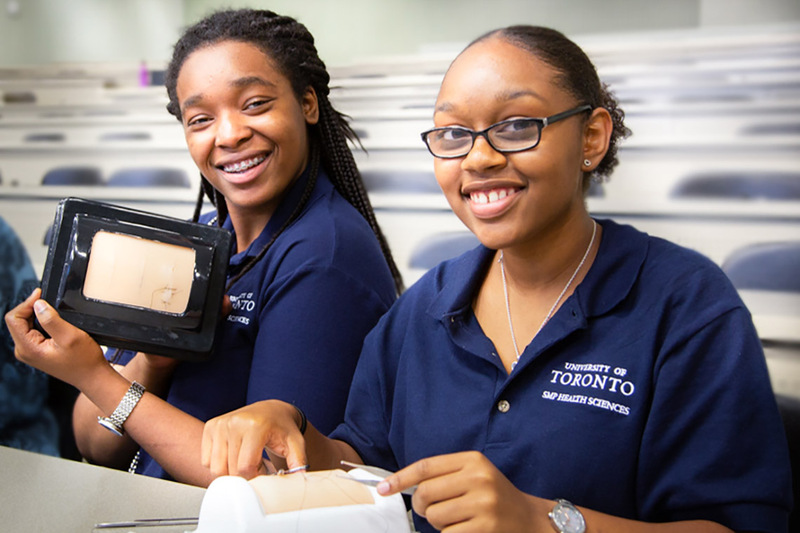 But this workshop in suturing – which creates strong, supportive connections to seal a wound – is just one example of the experiences offered by the University of Toronto's summer mentorship program (SMP). It’s also a metaphor for the program’s goals. Support and connection are key themes throughout the month-long program, which provides more than 70 high school students who are Black, Indigenous or from other under-represented backgrounds with mentorship opportunities and hands-on experience in health sciences. Idil Abdi, who will start Grade 12 in Thornhill this fall, was among the group of aspiring health-care professionals to take part in SMP this year. The group explored health-related professions – including medicine, nursing, public health and social work – through lab work, lectures and practical experience. Among the medical professionals the students met were pediatricians, radiation technologists and family doctors. “It was incredible to see how they all support patients and have a positive impact on their lives,” says Jacob Fraser, a participant in the mentorship program who hopes to become a family doctor. The program also provides students with career services like resumé and networking workshops. “Learning how to write a cover letter, present yourself and network was one of the highlights for me. These skills will help me navigate my way through the workforce today and later on in my profession,” says Tyler Cobbinah. Since the program launched in 1994, more than 900 students have participated and 85 per cent of surveyed graduates have since begun working toward or completed a university degree. SMP alumna Tonya-Leah Watts is starting her last year of undergraduate studies in biomedical sciences. Inspired by her time in the program, Watts is also preparing to write the Medical College Admissions Test. “Where I grew up, I didn’t see people like me pursuing medicine. In SMP, I made connections with other people of colour who supported me outside of the program and helped me apply to university,” she says. As it approaches its 25th year, SMP continues to be a catalyst for building strong connections between adolescents and health sciences and increasing the representation of Black and Indigenous people in medicine by investing in their success. Husam Abdel-Qadir graduated from SMP in 1998 after immigrating from the Middle East. Today, he is a cardiologist and clinician-scientist who volunteers with U of T’s diversity mentorship program and is the director of continuing professional development for the Black Physicians’ Association of Ontario.